Students and researchers from Arizona State University, Northern Arizona University and the University of Arizona are collaborating to grow algae using wastewater. The algae can then be harvested to create fuel, feed and food products. This multi-university collaboration is supported and funded by the Arizona Board of Regents Technology and Research Initiative Fund (TRIF). 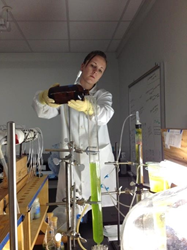 Northern Arizona University sophomore Emily Day pours growth media to an algae-filled column. Day’s efforts are part of the ABOR-funded multi-university program. More than 40 algae-related enterprises are located throughout the state, including industries stemming from university research. Arizona universities are working together to turn the state’s waste to gold – or at least renewable fuel. As part of an Arizona Board of Regents funded project, students and researchers from Arizona State University, Northern Arizona University and the University of Arizona are collaborating to grow algae using wastewater. The algae can then be harvested to create fuel, feed and food products. The collaboration is designed to advance the application of algae in Arizona as an industry to produce valuable products and remediate wastewater, and to educate and develop a workforce to support the industry. The goal is to maximize Arizona’s resources. On March 7, the public is invited to learn about the on-going projects at each university. The University of Arizona will host a public forum to present student work and projects which range from aquaculture to the study of algal DNA and the use of saline waters to grow algae. Contact jsmith(at)ag(dot)arizona(dot)edu for more information. This event follows the initial public presentation held at NAU on November 2, 2013 which introduced the variety of projects that Arizona university students are focusing on to advance Arizona’s algaculture. “It was a great first meeting,” says Terry Baxter, associate professor of civil and environmental engineering at NAU. “The students not only gave wonderful presentations about their work in a public setting, but they have become much more aware of how important it is to work together across the three institutions.” In addition to informing the public, these meetings also allow researchers from each of the public institutions to share information, generate and discuss new ideas, and develop new approaches that can ultimately advance the work that is being done in Arizona. Arizona serves as an ideal location for algae research with expansive non-arable land suitable for algae farms and more than 330 sunny days per year to encourage algae growth through photosynthesis. More than 40 algae-related enterprises are located throughout the state, including industries stemming from university research. The project is funded by the Arizona Board of Regents Technology and Research Initiative Fund (TRIF). To learn more about the ASU Arizona Center for Algae Technology and Innovation, visit azcati.com.